We all know and hate the feeling...during a busy day on the town, after using maps, apps, and countless texts on your smartphone, the inescapable dread of watching the battery drop to critical levels sets in. If you're lucky, you have a charger on you, and can beg some power from a local bartender or the rare unoccupied coffee shop outlet. But this is the future, and now there's a better way to handle these things. This is what hitting rock bottom as an "Angry Birds" addict looks like. Behold, the Strawberry Tree. 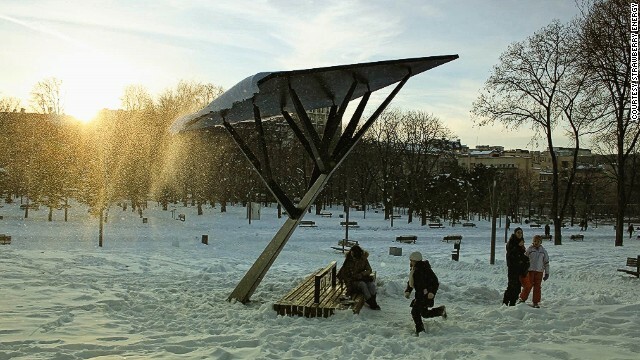 According to CNN, the Strawberry Tree is solar-powered public charging station that was developed by Serbian student Milos Milisavljevic, who has an eye for clean technology. After winning the Verge Accelerate startup competition, the invention has now spread to various cities and towns throughout Serbia. Entirely solar powered and built from recycled/recyclable materials, the Strawberry Trees contain enough power to continue their charge mission even if it hasn't been sunny in twenty days. Sixteen USB and wi-fi plugs allow for power for the masses. You never have to boredly keep an eye on your children playing in the park, ever again! The Strawberry Tree, named for the first fruit of summer, also cares about your well-being. Its chargers indicate local amounts of air pollution, noise levels, and UV radiation. Plans in the future could include even more localized environmental data. Plus, it is there for you in an emergency. As Milisavljevic says, "Strawberry Tree could have an emergency button which would send a signal to emergency services that you are in danger, and in any kind of a disaster, for example if the power grid is down, the Tree would be the place where you could call for help and get in touch with your loved ones." The future is for everyone, and now its technology has become a little more helpful to the common person. Just try not to spend a whole nice sunny day in the park messing around on your phone. Old wonders and new can coexist peacefully in this new future.